Maneuver. Plays on an opponent's mission. When an opponent moves a ship to this mission, you may destroy this event to take each ship from your copies of Engage Cloak, place them at this mission, and begin an engagement involving them. If you win, randomly kill an opponent's personnel involved. 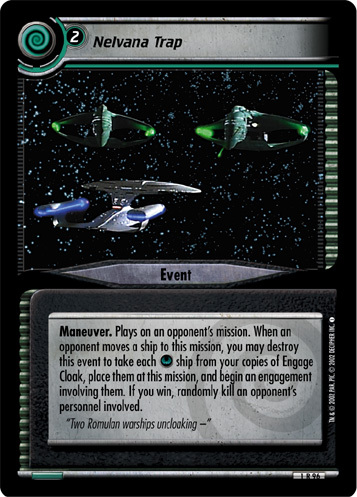 "Two Romulan warships uncloaking -"
Characteristics: engagement, kill opponent's personnel, Maneuver, plays / place on a mission, ship related card. There are 22 entries for Nelvana Trap (ST2E 1 R 96) at the Tradeplace (14 haves and 12 wants). Click here to see all trade list entries for this Rare card!